When I was a kid an exciting new mall opened... it was GIGANTIC. 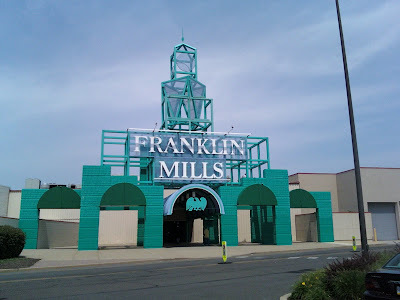 They called it "The Franklin Mills Mall" but to me, it was like going to Disneyland. This mall was so big that on the rare occasion we visited it meant a day of sore feet and adventure. OK, maybe I am overstating it... but it was a fun place to go. Over the years the mall has been dying a little. It lost many of the top stores that made it a great place to shop. They have been replaced by lots of outlet stores and far too many empty stores. Still, when I was in the neighborhood I decided to stop by and check it out. Hey! 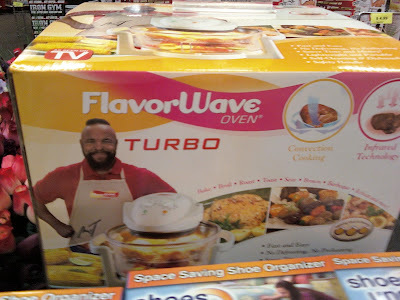 It's Mr. T and the FlavorWave oven! I actually met Mr. T in this mall when I was a teen. He was promoting his comic book at the time. Today, it's the Flavorwave. If you haven't seen the infomercial for this product, I suggest you seek it out. If it is to be believed, this oven is like a magic crock pot that can make dinner for 4 in 30 seconds. And I do believe it. Mr. T has never steered me wrong. Sorry, I was just thinking of how cool it would be to actually BE Mr. T's car. I pity the road. 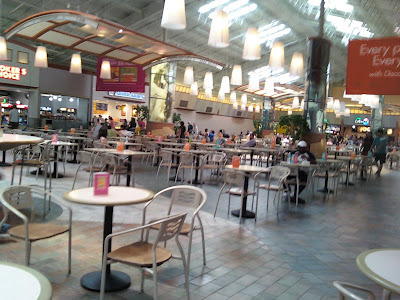 This is the food court area. This is where I met Mr. T.
Today I met a taco and heartburn. 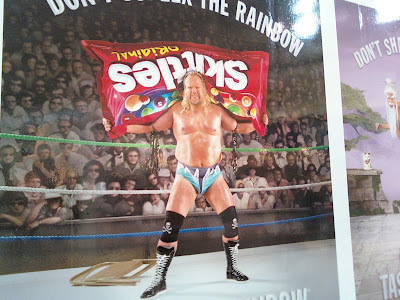 This was a giant poster of a guy beating up a bag of Skittles. Here is another weird ad. 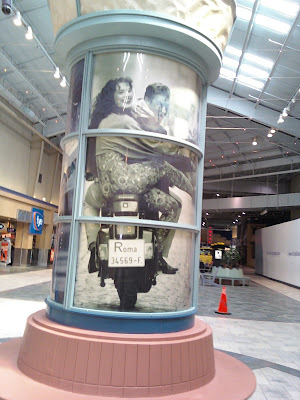 I don't know what it is for, but it shows a Geena Davis looking lady riding on the back of a motorcycle while wearing crazy pants. She isn't wearing a helmet. 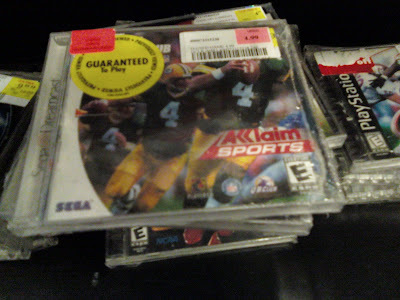 These ancient Sega Dreamcast games said they are "guaranteed to play." I decided to prove them wrong. I didn't play them. This is a DVD called Forever Lulu. It's about two Martina Navratilova looking broads that turn New York City upside down. 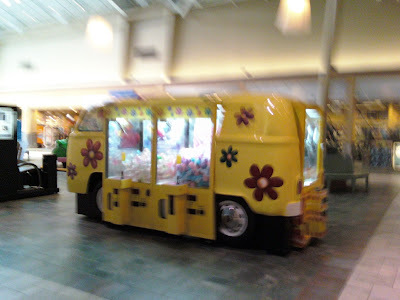 This "claw machine" was shaped like a Volkswagen bus. I assume it was full of dirty hippies. 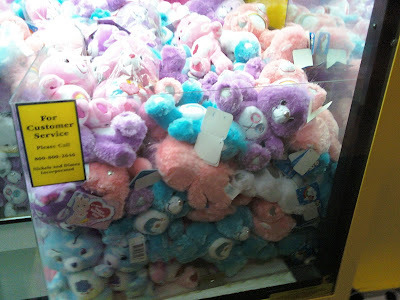 No wait... it's full of Care Bears. That's even worse. 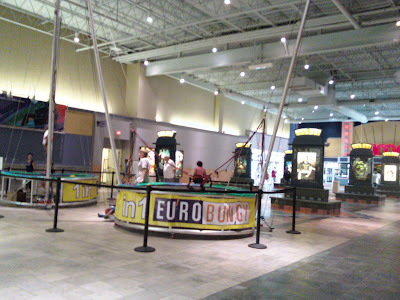 This was a bungee jumping thingamajig. Sure, it's exciting... but not as exciting as putting on crazy pants and riding on the back of a motorbike with no helmet. Last night I watched WWF wrestling from Madison Square Garden... from January 23, 1984. That was the night that Hulk Hogan won the WWF title from Iron Sheik and rocketed Hogan to become an international star. I have a subscription to a service called WWE Classics On Demand through my cable service. It is ESSENTIAL to anyone who is or was ever a wrestling fan. Every month a few dozen programs are added from many different wrestling federations and many different decades. A long time ago they reran the Hogan/Sheik bout. I recorded it and last night I finally watched it. Usually I skim through these old wrestling cards. I watch matches that seem good and skip the ones that seem to be a waste. It was interesting to relive what it must have been like watching that show back in 1984. The card had some other great moments. 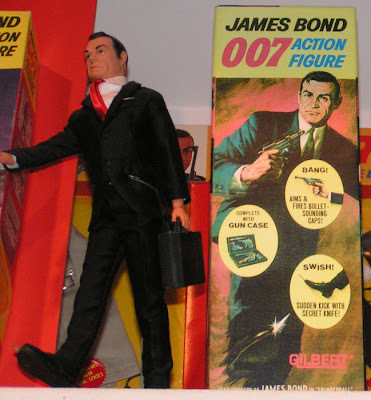 A pre-G.I. Joe Sgt. Slaughter was on the card. He was also what they call a "heel" or a "bad guy" or a "Baldwin." Also on the card was a midget tag match. During the match one of the bald midgets was turned upside down and spun like a top. I know, I know. It's politically correct to say "little person." As much as I understand that using the wrong term can be degrading... HE TURNED HIM UPSIDE DOWN AND SPUN HIM LIKE A TOP. The term "midget" was the least degrading part of the match. Anyway, I am stalling just to add extra paragraphs to a really paper thin topic. Bottom line is that after Hogan won the title the show still had over 1 hour left. So, to keep the focus on Hogan they cut back to him a couple times. 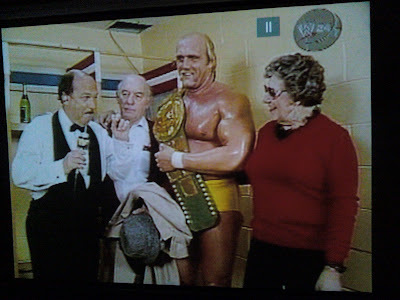 Hulk Hogan was interviewed with his parents. The other day I was driving by a Long John Silver restaurant. The sign in the window read "Lobster Bites $2.99." I pulled the car over and ran in. I asked for the "$2.99 lobster bites" and handed them money. They brought out a lobster and it bit me. No, that's just silly. Actually they gave me a very generous portion of deep fried lobster... or so I thought. The truth is that it isn't reeeaaaallly lobster. It does seem odd that they can afford to sell lobster IN ANY QUANTITY for under $3. Now, I don't have a horror story to tell you. There isn't anything terrible in there, it just isn't lobster. At least not the lobster you expect. 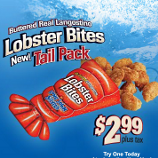 They refer to the meat as "buttered real Langostino" a quick Google search finds that Langostino is a code word for SQUAT LOBSTER. Seriously, that is what it's called. ...not lobsters at all, but are more closely related to porcelain crabs, hermit crabs and then, more distantly, true crabs. I don't have anything more to say. 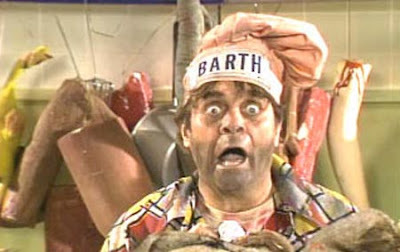 I just wish I had You Can't Do That On Television on DVD. 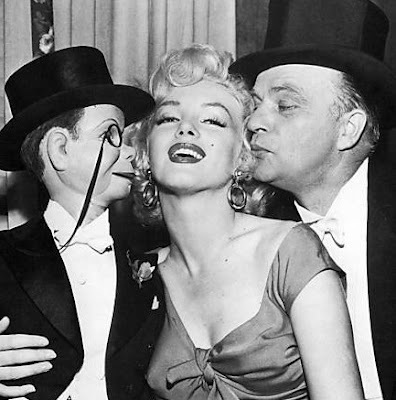 ANOTHER Charlie McCarthy board game! 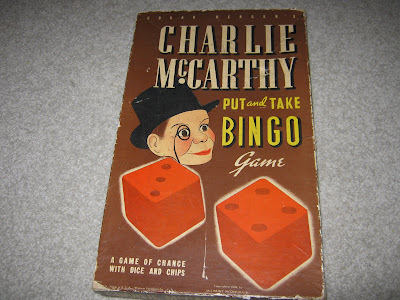 A while back I did a junk about board games featuring Charlie McCarthy. It was an in-depth study of several board games that were produced in the 1930s starring the famous ventriliquist dummy. I had been collecting them for a brief time before I wrote the peice and I thought I had covered ALL of the Charlie McCarthy games produced. This popped up on eBay the other day. It's called Charlie McCarthy Put and Take Bingo. It's a pretty simple game with one complicated twist... IT NEVER ENDS. Seriously, if you follow the rules for this game you will play it for the remainder of your LIFE! Perhaps that is why I couldn't find any information on the internet about this game. Maybe there are some folks out there STILL trying to roll an 8 so that they can take back the last chip. Since this article was neither funny nor informational I have decided to suppliment it with photos and random info. Trousers are an item of clothing worn on the lower part of the body from the waist to the ankles, covering both legs separately (rather than with cloth stretching across both as in skirts and dresses). Such items of clothing are often referred to as pants in countries such as Canada, South Africa, Northern England and the United States. Additional synonyms include slacks, kegs or kex, breeches or breeks. This is the report of my second day on the Disney Wonder. If you haven't read part one... good for you! Close your browser and go outside and enjoy the world. This was the first full day on the ship. On this day they docked at Nassau in the Bahamas. Oh, Nassau, you classy vacation destination! The tour took us around all of the finest spots in Nassau. Anyway, eventually I ended up at the zoo. The flamingos also do a show in a small area there. Nothing spectacular, but tons of fun. I was a volunteer for the show and that meant that I got to stand in the middle of the area with a half dozen other guests as flamingos pecked at my clothes and leaned on me. It was awesome. They also had other birds, goats, meerkats and other animals. The characters were in formal wear on this day. The show on this day was Toy Story : The Musical. It was a lavish show that ran about 70 minutes. The music was great and the performances were superb. After dinner I got to get my picture taken with Captain Gus. If you are wondering what happens when he is not at the helm he said "There are many other captains on the ship. Captain Mickey, Captain Jack Sparrow and Captain hook..."
The post that was too EXTREME for Micechat. Recently I became enthralled with the lovable story of The Lion King. It's always been one of my favorite films, and after a recent trip to Walt Disney World I decided to pop the DVD into that machine that takes the DVD and coverts it into a movie so I can look at it on that TV looking thing. What I found shocked me to my very core. OF COURSE I WANTED TO KNOW MORE ABOUT THE MS KONGSHAVN! I would like to say that what I found out was that the link led to a funny New Yorker cartoon where King Kong had muscular distropy and was trying to shave. I would also love to tell you that the story of MS Kongshavn and it's time as The Lion King is a story worth telling. But, that won't stop me. In 1979 a ship was built named MS Turella in, Turku, Finland. The ship has changed owners and names several times. It was the MS Stena Nordica, MS Lion King and MS Fantaasia before becoming the MS Kongshavn. So, after reading about the ship I went back to watching the ENTIRE Lion King quadrilogy. You didn't know that they made 4 Lion King films? Then you are a stupid, stupid fool. The Lion King: Like the majestic MS Kongshavn, The Lion King sailed to the top of the box office. Ha ha ha ha. Anyway, I love this film. The stuff with Timon and Pumbaa is hysterical. The dramatic storyline with Scar is top notch and the music is fantastic. The Lion King II: Simba's Pride: This was later retitled The Lion King 2: Simba's Pride. This was a Romeo and Juliet type story. It could have used more comedy, but it isn't bad. I was very disappointed on first viewing (in the late 1990s) but watching it again this week, it seemed much better. On its initial release, The Lion King II: Simba's Pride was released in 1:33:1. For the special edition, this was changed to 1:66:1. Another major change to the special edition release was the quality of the image. It was lightened considerably and colors appeared brighter and slightly less saturated. Also, a small change in animation was present. As Kovu attempts to distract the crocodiles attacking both him and Kiara, he falls into the water and submerges a short time later. In the original release of the film, he yells open-mouthed as a crocodile swims towards him. 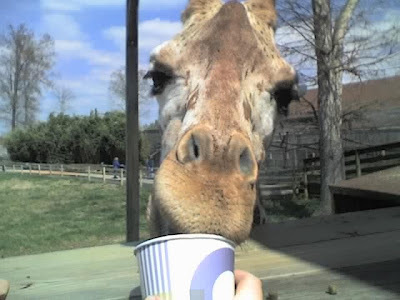 In the special edition, he does not open his mouth as wide and turns his head sharply to face Kiara. I am mildly disturbed that someone noticed that. The Lion King 1 1/2: This is SUCH a funny movie. It starts out with Timon and Pumbaa watching the first Lion King film and then they decide to show us what they were doing during the first 40 minutes of the original film. The result is really genius. It's an excellent movie. The Lion King: Circle of Life: An Environmental Fable: I am so sick of hitting the ":" key. This is a 12 minute film that shows in Epcot. In it Timon and Pumbaa want to build a resort and Simba explains to him that stupid humans are polluting the earth with resorts and that he shouldn't build one or he is as bad as a person. This film is being shown at the Walt Disney World resort.